Tiki Oasis is an annual 5-day event in San Diego, California for lovers of Island lifestyle and purveyors of Polynesian Pop. Wednesday night opens at the historic Bali Hai. Thursday-Sunday at the Crowne Plaza offers events through out the day and night, such as live music, DJs, 100+ vendors, educational seminars, car show, and tropical cocktails by the pool. FORMERLY THE HANALEI The Crowne Plaza is the official hotel of Tiki Oasis and where most of the events are held. Set amid waterfalls, lava rock pools and 8-story glass elevators. You will find classic Tikis featured in Sven Kirsten’s The Book of Tiki. Easy access to a dip in the pool, live entertainment, car show, and the marketplace. NOW SOLD OUT. If you would like to join the waiting list, please click here. Who will be Miss Tiki Oasis 2018? See our Top 12 Contestants! Have a vintage car you want to exhibit at Tiki Oasis? Apply today! If you can’t travel to a tropical paradise, at least you can watch it on the big screen and imagine you are there. Like Tiki bars, Hollywood recreated an environment of the South Seas for the similar purpose of allowing the landlocked urbanite to escape the concrete jungle. Visiting Polynesian supper clubs, Americans cast themselves in their own South Seas movies. The stories (Hurricane, Mutiny on the Bounty, South Pacific), the film sets, the special effects, all coalesced to create the environment of the Tiki Lounge. 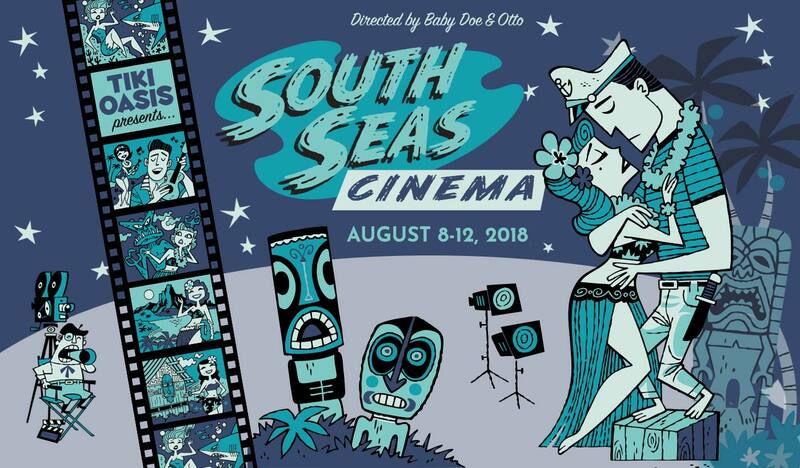 “South Seas Cinema” is a motion picture genre that is set on the tropical islands of the Pacific (Polynesia, Melanesia and Micronesia), or using the “Hollywood” definition – any tropical Oceanic isle. The genre is anchored by action movies and documentaries like The Hurricane, Kon-Tiki or South Seas Adventure that give a glimpse of Western man’s excursions around the Pacific Islands. And musicals such as Waikiki Wedding, Pagan Love Song, or Elvis’ Blue Hawaii plus dozens more ensured that the islands were in our ears as well as our eyes and our hearts. The pinnacle of South Seas Cinema is Rodgers and Hammerstein’s movie musical “South Pacific”. From August 8-12, 2018 you can escape to “South Pacific”, or many other films, at Tiki Oasis. Read more about our 2018 theme here.